We're saying goodbye to the beach in Plymouth and finally heading home to Austin. 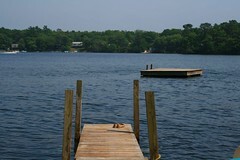 Although I'll miss being steps from the water, I'm looking forward to getting back into the swing of things at home. Kitties, my sewing machine and my own bed. Sweeeet! Wow, that's beautiful, but home is a'callin'! Happy travels.